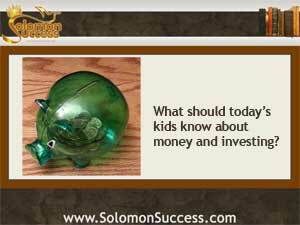 Solomon Success > Blog > Should Parents Teach Kids About Investing? King Solomon believed that wisdom begins at home. Many of his Proverbs are directed toward the younger generation: “Hear, ye children, the instruction of a father, and attend, that you may know prudence. I will give you a good gift, forsake not my law.” (Proverbs 4:1) In today’s world, too, parents who want to raise financially responsible children need to think beyond the old paradigm of an allowance and a basic savings account. Now, giving kids the skills to build wealth for a lifetime includes teaching them about credit, online safety, and even investing. Young children can begin learning basic concepts like saving and interest with physical money – bills and coins that can be stacked, added to and subtracted from to teach those simple ideas. Opening a savings account can be a big part of that kind of learning, too, allowing kids to track the progress of their money through a bank’s monthly statements along with deposits and withdrawals. Money-smart kids need to know a few other things, too. Managing credit and establishing a good credit score is essential for future success in investing – and many other things as well. A teenager going on a spending spree with a parent’s credit card is an old cliché – but helping kids to understand borrowing and the wise use of credit can lay the groundwork for taking on the kind of “good debt” such as a mortgage or student loan that yield a return.